The Marshall Sandpiper is a 15’ traditional catboat perfect for sailors wanting a solid, stable, daysailer or simple one-design racing class. With similar seaworthy characteristics as the larger cats, she has proven to be ideal for worry free performance, dependability, and ease of handling. With an optional hinged mast and a trailer, she makes an ideal trailer-sailor that can be rigged, launched, and ready to sail in minutes. One-design Sandpiper racing is quickly on the rise with established fleets in Florida, New Jersey, and New England. It is quite a site to see twenty or more of these classic boats gracefully zipping around a racecourse, although what really stands out is the camaraderie and enthusiasm within the fleet. The growing popularity of the Marshall Sandpiper as a racing class has brought about the founding of the Sandpiper Class Association. The association’s mission is to promote the Sandpiper class, develop Sandpiper racing, encourage and foster the sport of sailing and do anything else it can to support Sandpiper sailors and enthusiasts. 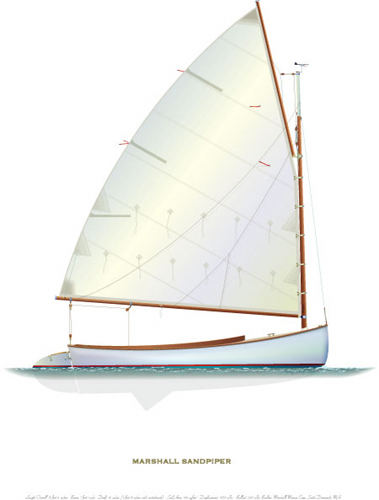 The Sandpiper is a one-design class member of US Sailing as of December 2012.